Looking through the blurb from Continental, the goals were simple enough when developing the GP 5000 and GP 5000 TL – The goal was to improve and upgrade the 4000’s rolling resistance, mileage, speed, as well puncture protection. And, importantly, the new tyre also had to embrace new technologies that themselves were being embraced by the market place, like tubeless tyres. The end result is two tyres, the GP5000 and the GP5000 TL (tubeless). 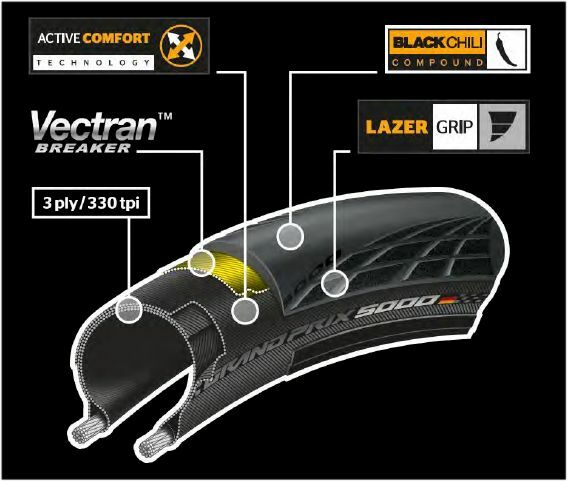 — Laser grip: The lazered micro profile structure expands over the tyres should and provides outstanding cornering. — Active Comfort Technology – a compound material that enables vibration damping while it is not having influence on the rolling resistance. It balances stiffness for steering and comfort for directional stability. — Vectran Breaker: A synthetically produced high tech fibre that is extremely tear resistant for minimal weight helping the GP 5000 give stronger and be more protective than ever. — TL (Tubeless): The TL technology is designed for them to be easier to install, simply with a standard track pump. Like the GP4000 before it, the GP 5000 and 5000 TL are all-round tyres (racing and training) that are designed to be used all year round as well. The GP 5000 not only feels like a quality tyre but this racing tyre also rides with a level of ‘comfort’ and stability on the rim helping riders be faster. As such, it’s ideal for beginners as well as seasoned pros. Lets face it, puncture resistance is generally down to ‘the luck of the draw’ as there will always be something on the road that will tear through anything but the general consensus of reviews is that the GP 5000 and more so the GP5000 TL are both very good in the puncture resistance department with many a reviewer saying that during the review period, they hadn’t punctured the new tyre. And lets not forget Continental’s Get the Grip promotional phrase (Get the Grip) and so it’s no surprise that the GP 5000 provides even more grip than before with that grip evenly distributed over the tread of the tyre, providing sufficient grip even when banked over into a corner, grip that is very important especially these days with the braking power of discs on bikes. And while the grip has improved, the new GP 5000 is said to roll 12% faster than the GP 4000S II, and important to keep riding time at its maximum, the GP5000 is said to be 20% more puncture-resistant. When it comes to the rolling and aero qualities of the tyre, they were tested by Image: Aero-coach – https://www.aero-coach.co.uk/gp-5000-tubeless-data – in their tests they summarised the results with “In this test we found that the wider versions of the GP 5000 were faster, but that the clincher GP 5000 25mm was marginally faster than the tubeless GP 5000 TL 25mm.